Alsace Lorraine France is actually two regions. 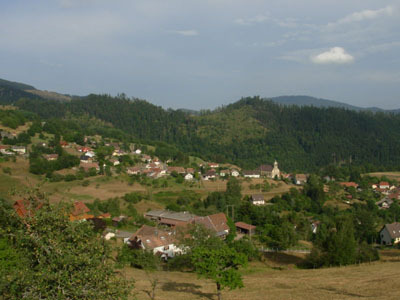 The Alsace region of France borders Germany, and the region of Lorraine is on the other side of the Vosges mountains. Below is a beautiful travel story by a guest writer, seasoned traveler and visitor to this site. It is a perfect example of a French culture travel experience. 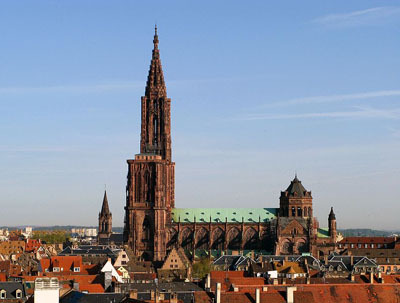 For reasons I forget, business took me to Strasbourg, in Alsace France, some years ago. While business trips rarely afford opportunities to explore and to soak in local lifestyles, this one did -- and in unexpected ways. But my time in Strasbourg was sadly brief, my next stop being Zurich, on Monday. As serendipity would have it, rescheduled meetings and one of those many Saint Days they have in Europe meant that my Friday was entirely at liberty, so late on Thursday I rented a little Citroen, and left central Strasbourg before the dawn on Friday -- destination: Interlaken, Switzerland, from where I would launch my assault on the Jungfrau Glacier on Saturday. (Not really an assault, as there is a narrow-gauge railway to the mountain summit and its glacier, where the Swiss have kindly situated an inviting restaurant.) From there, it would be on to Zurich late Sunday. An overview of the basics when driving in France. My chosen path south was the D468 -- certainly not the fastest route, but I was in a hurry to see the Alsatian countryside, and its villages and hidden squares, not my Swiss destination. And see it I did. River fog often swallowed me, with settlements appearing out of the moist mist and just as quickly disappearing. Half-timbered houses and castles built to repel the Germans (or was it the French?) lurked nearby, with tree-lined roads and meadows to keep me company. While enjoying scenic drives one needs a good Alsace road map …see our road map France guide for the best one for your adventure. About an hour south of Strasbourg I found myself in a particularly pretty village when my "Bakery" radar alarm went off, impelling me to stop for tea and buttery carbohydrates. The only store open at that still-early hour on a holiday, the bakery's yellow lights spilt onto the sidewalk and on into the street, its pair of bistro tables almost sounding a Siren's call. 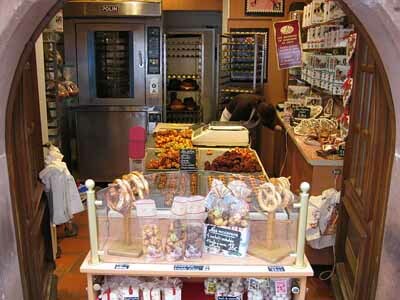 Being France, bakeries are taken seriously, and not only was there very fresh bread, but all manner of croissants, and a hissing coffee machine. Being Alsace, German concoctions I could not name were in abundance. I felt dizzy. I decided on a croissant (OK, two croissants) and some tea, which were brought out to one of their little tables on the sidewalk where I had established my base. It was particularly enjoyable to place my order in German -- it's Alsace! The brown-haired girl (for she was a girl) behind the counter giggled a bit when I called her Fraulein. It's old-fashioned these days -- all the better to make a statement. Halfway through my first croissant, and just starting in on my tea (served in an actual pot!) a clearly foreign woman with a sleepy child exited the bakery, looking to get a table. As there were but two, and one was occupied by two older men who appeared to have eaten at said table for the past thirty years, I offered, in French, for them to join me. (That child -- a girl with red hair -- was indeed tired.) She replied Thank You, in English, settling the girl into a chair nestled by the front of the bakery against which she could rest. Monica (no surname was offered) had short, black hair -- very black -- and a well-healed, yet clear, scar on her broad forehead. She spoke in the forthright manner of someone who has made a way for herself. She was also a coffee person -- actually a Cappuccino person -- who regaled me with the history of what clearly was her favorite beverage, and why its consumption should be restricted to breakfast. Monica was a serious woman. As we spoke -- she of breakfast beverages and I of the proper way to make a croissant (it involves real butter and lots of folding of the dough) -- an older woman dressed in the quaint black suit of a Protestant minister asked if she could borrow a chair. At first I thought this morning was turning into a politically incorrect joke (a minister walks into a bakery...) but on quick reflection I saw this as an opportunity, and asked the minister (who was indeed just that) to join us. Monica was formal but welcoming, as the three of us (niece Maria was quietly asleep) spoke in a combination of French, German and English. The minister, who referred to herself as Mother Agnes, was the lone official representative of Protestant Christianity in the area, and made it a point, we were told, of always wearing her clerical uniform -- "flying the flag" she put it. Mother Agnes was quite the charmer. More beverages were offered by the Fraulein who was running things at the bakery, and we settled in to wide-ranging talk on yachts, hot chocolate (we were all in favor of it) and the relative advantages of linen vs. cotton as material for a tablecloth. Both of my breakfast companions were quick studies, with Mother Agnes being particularly adept as using body language (such as leaning in when someone is speaking) to bond with people. She was, indeed, pastorally trained. I was having a ball. But it was Monica the Dentist who intrigued me most, with her kindly formalism, and clear doting on her little niece, who was shifting now and again in her chair to better find a restful position. Mother Agnes picked up on something in Monica's inner thoughts, finally asking her if she was married and if Maria (who was only introduced by name, not affiliation) was her daughter. It was then that Monica's face altered so slightly, replying "No, she was not." Mother Agnes, sensing what I saw as tension and sadness, replied with a gentle smile that Monica's wedding ring, and the clear affection she held for the little girl, caused her to think they were mother and daughter. "Maria in my niece," Monica said flatly, looking directly at the cleric. "I am a widow." She said the latter in French, the word for widow also, I recalled, being the word for a Guillotine. With that statement, the tone shifted, with Mother Agnes saying in the most sympathetic tone I recall ever hearing, and after a precisely timed pause, "I am so sorry for your loss." I said I was saddened to learn this, but my delivery was less generous. "It was a quick passing," we were told. Sensing, I think, that an indirect approach was best, Mother Agnes talked about members of her flock who had lost loved ones too soon, and some of the ways such had affected them, and how they coped. I took this as indirect counseling, with Dr. Monica listening more intently than politeness called for. I just sat back, offering the odd comment, but mostly just watching it all, wishing I could take notes, the interactions of the two women being so rich with meaning as the conversation progressed and transitioned. I recall thinking that Monica the Dentist might not have ever actually talked much about her husband's death, and speaking with friendly strangers in a foreign place over good food can offer peculiar opportunities for frankness. It seemed cathartic for her, and her efficiency beginning to morph into strength and a bit of hesitant comfort. In time niece Maria began to awaken, with Monica offering a small pain au chocolate she had saved, the sweet blackness getting on the little girl's face, a sharp contrast from her hair. It was time to go. Monica, holding her now-awake little niece, who shared the attentiveness of her aunt, offered me a friendly, firm handshake. She held Mother Agnes' eyes for two heartbeats before remarking that she had so enjoyed their chat, with our Protestant minister offering her and her niece the wish of peace and good health, before kissing each on the forehead. And off the two went down the sidewalk, which was now more active with people. I said my good-byes to Mother Agnes, who gave me the pastoral two-hand handshake before going on her own way. I often think about this random event in a little bakery in Alsace, wondering if such encounters are really accidents, or whether some power is at work whose intent I can only guess at. Or perhaps it's just that Alsatian bakeries, and a few welcoming gestures to strangers, can bring much wealth. In any case, Monica the Dentist, with her raven hair and cut forehead, little Maria and Agnes the Minister will likely remain with me for some time to come.